Home / Editor's Choice, Entertainment News, Forum and discussion, Gossip and Drama, Politics / SHOCK as fake prophet DAVID OWUOR is linked to Sexual assault, he messed a LADY -Court documents reveal everything. SHOCK as fake prophet DAVID OWUOR is linked to Sexual assault, he messed a LADY -Court documents reveal everything. 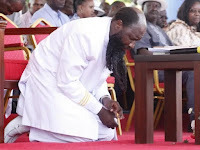 Sunday, February 10, 2019-Controversial prophet David Owuor of Repentance and Holiness Ministries has been touring various Countries across the world to preach and perform his usual fake miracles. Hardly a month passes before the controversial prophet visits a foreign country but there’s one Country that he avoids like a plague and that’s the United States of America(USA). The Kenyan DAILY POST has learnt that the bearded prophet has a sexual assault case in the USA where he used to work in the early 2000’s. We came across court documents where a lady identified as, Hua Zhu, who was Owuor’s co-worker in a Laboratory, accused him of sexual assault and sought damages of at-least $1M. For those who don’t know, Owuor is a genetics scientist and he worked in the US before he became a preacher. The woman revealed that Owuor sexually assaulted her after giving her alcohol when they were conducting a research in the lab. Sexual harassment is a very serious offence in the US and it doesn’t matter when it happened as long as the case has never been withdrawn. Remember comedian Bill Cosby was sentenced to prison for sexual assault cases that stretches from early 1990's to 2008. Owuor sexual assault case happened in the early 2000s and if he dares step into the US, then that means he risks being arrested since. Now you know why Owuor is always full of bile towards the United States of America and keeps on prophesying bad things about the so called land of milk and honey.